Shall we all agree that ivory lace and fabric looks so amazing and feminine when combined with the color and texture of burlap? 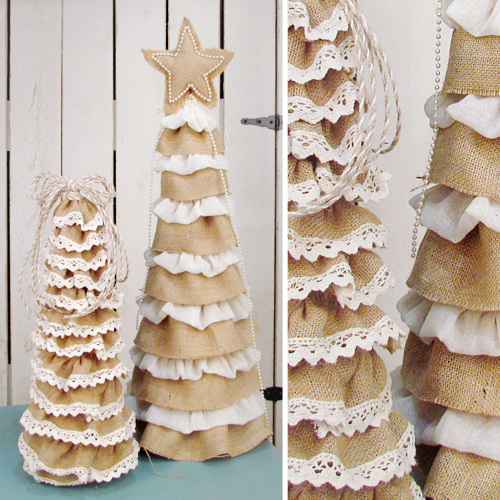 These cute ruffled burlap and ivory Christmas trees were super simple to make and can be displayed during the holidays or at a wedding or even as everyday decor with a rustic theme. 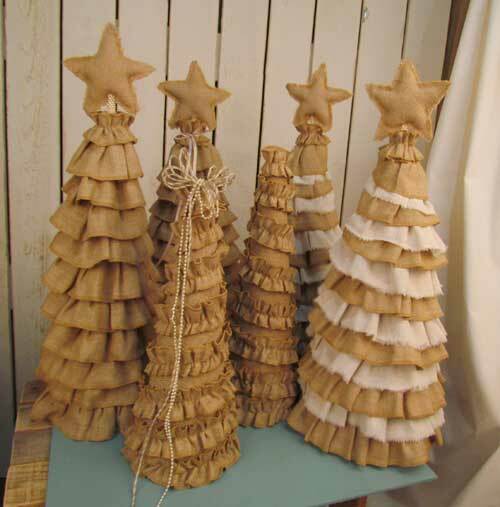 I recently made several trees to sell at an October craft show and I was surprised at how easy and quick these trees were to put together when I used our pre-ruffled burlap ribbons. Following is a brief outline of how I created one of these tree designs. The basic process is the same for all of them and you can change up the look by changing your materials or fabrics. The possibilities are limitless! If you can find a pre-made tree form at a craft store that is the correct size, you can spend a little extra money and save time by skipping the next few steps. However, if you take the time to make your own form, you can be picky about the size and get exactly what you want. It’s very simple. Roll your poster board into a megaphone shape with a small opening about 1/2 inch on one end. You can make it either short ‘n’ fat or tall ‘n’ skinny. If you’re making more than one tree, it’s cute to make several different sizes. You’ll want the styrofoam disc to fit loosely into the bottom of the cone. But don’t wedge the disc up in there yet, just test it for size right now. Once you’ve got a shape/size you are happy with, tape the poster board into the cone shape. Use lots of tape to cover any poster board overlaps. Crumple up newsprint or any type of paper filler and stuff into the cone. Make sure you get some small pieces stuffed all the way up to the top. You can stuff the top inch or two from the top opening. 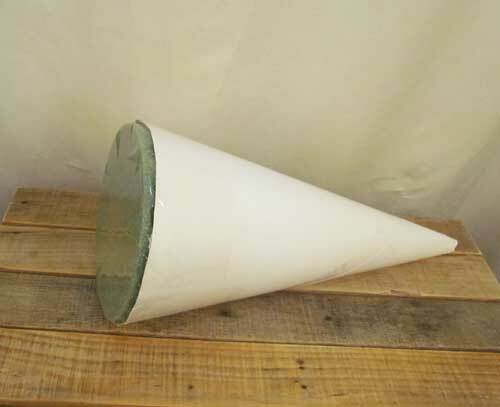 Loosely place the styrofoam disc inside the cone and mark the cone around the bottom of the disc. Try to make the disc as level as possible but don’t worry too much. You will be able to adjust it for levelness in a minute. Now trim off any extra poster board around the bottom. Keep trimming until the cone can sit snugly down over the top of the styrofoam. 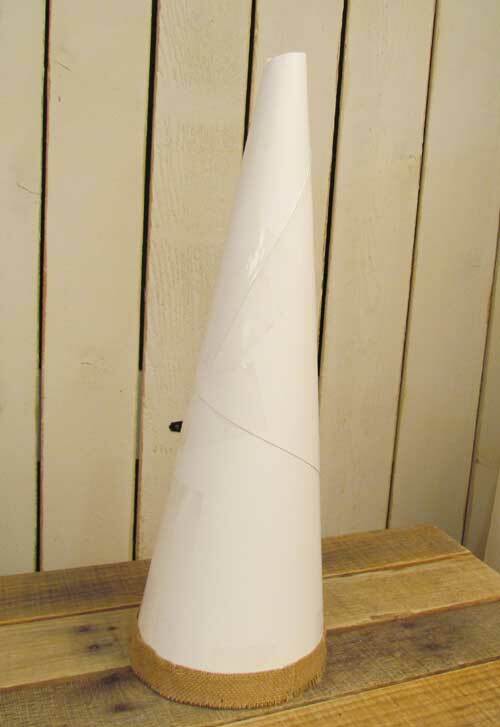 Adjust the placement of the cone until it stands straight on the styrofoam. This is an important step because if you don’t get it standing upright now, you will forever have a leaning Christmas tree! It’s ok for the disc to show under the posterboard. You are going to cover all that soon. Just keep messing with the placement of the cone and the disc until you get the disc wedged tight and the tree straight. Glue the disc into place with a hot glue gun or regular crafter’s glue and give it time to set up firmly. From this point on, all gluing should be done with a hot glue gun. Now double down on the styrofoam by taping it into place also. Use a generous amount of packing tape and tape multiple times across the bottom of the cone until the styrofoam is mostly covered in tape. Now your base is finished! If you purchased a base, you can pick up with us now on the next step. 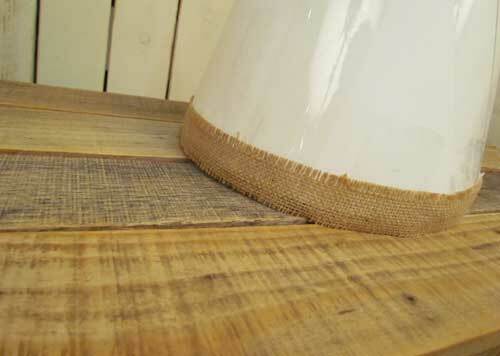 Glue a band of the 1″ wide burlap ribbon around the bottom of the cone. Make sure that the lower edge of the ribbon comes all the way to the table so that the poster board and styrofoam are fully hidden at the bottom of the tree. Now take your 4″ ruffled ribbon and begin gluing it around the bottom. Place it so that the bottom edge just brushes the table. Make one complete row around the bottom. When you get back to the beginning, keep going but begin gradually moving the row up until the bottom of the new row is just touching the top of the old row. This is the spacing that you want to keep now all the way up the tree. 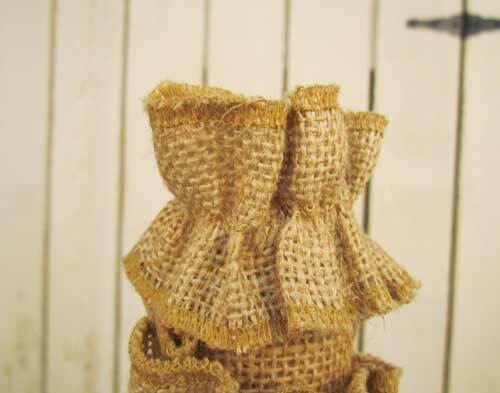 Be sure to gently hold the burlap against the cone for a moment or two to give the hot glue time to set up. This will keep the rows from sliding around after they have been placed. Somewhere about 2/3 of the way up the tree, you will want to start adding a few extra pleats to give the ribbon a little more fullness. 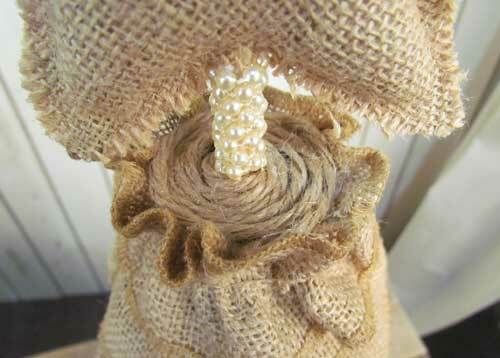 This can easily be done by pinching up the burlap after you’ve glued it on but before the glue is set. Wrap all the way to the top in a continuous line. When you reach the end of the first roll of ribbon, just glue that down and overlap the new one over it by approximately 3/4 inch. Remember to continue to pinch in some extra fullness as you get to the top so that your layers are fluffy. 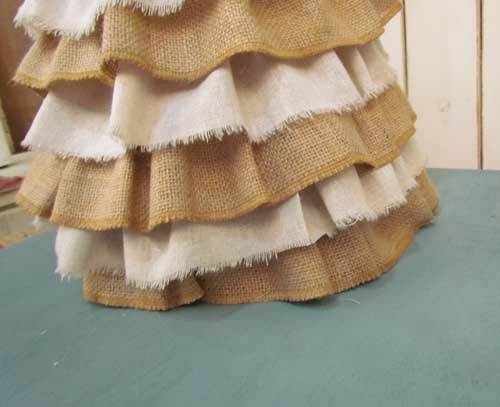 When you reach the top, cut the ruffle at an angle from the top to the bottom as shown below. Then glue the raw edge to the top of the tree, pinching and ruffling it with the glue. Now tear (don’t cut) 5 – 6 strips of fabric. 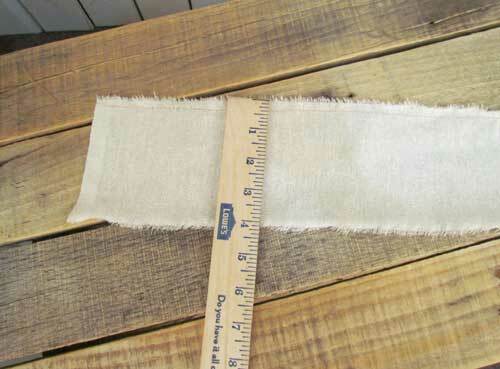 Each strip should be about 4″ wide and 44″ long. 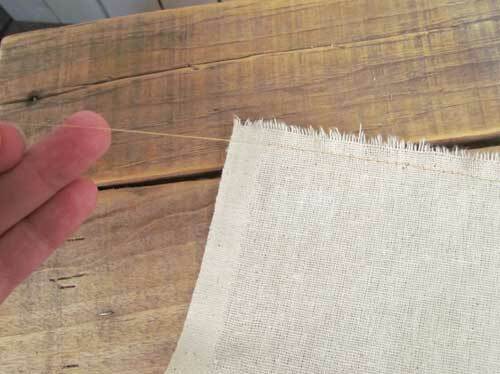 Gather the fabric by stitching with a machine along one side with a long spaced running stitch. 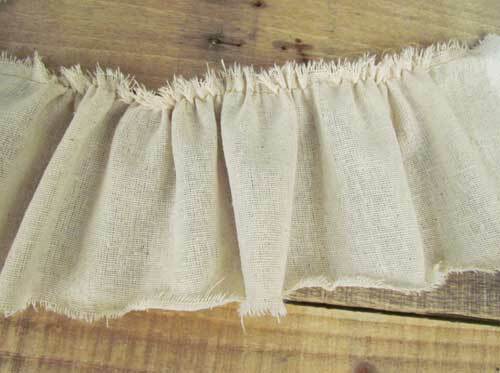 Pull the thread from the back side to gather the fabric to create a ruffle. 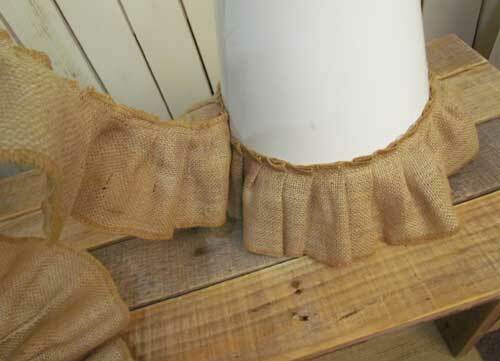 You will glue the fabric ruffle to the cone about 2″ above the burlap ruffle all the way around. 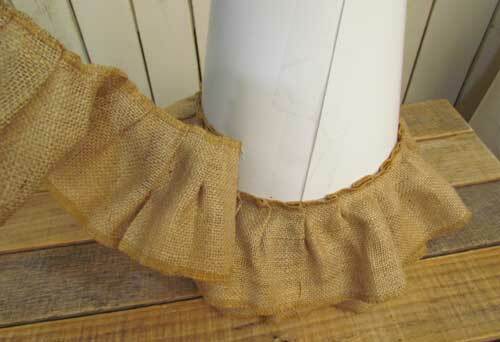 But first, start at the bottom where your burlap ruffle first began to incline. Tuck the fabric ruffle up out of sight there and glue in place. 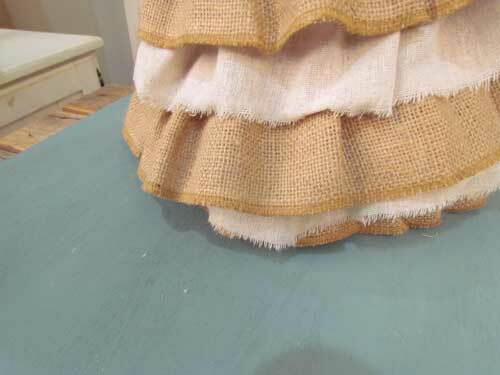 Let the fabric ruffle slowly begin to appear under the burlap ruffle until it is about evenly spaced between the burlap ruffle above and the burlap ruffle below. 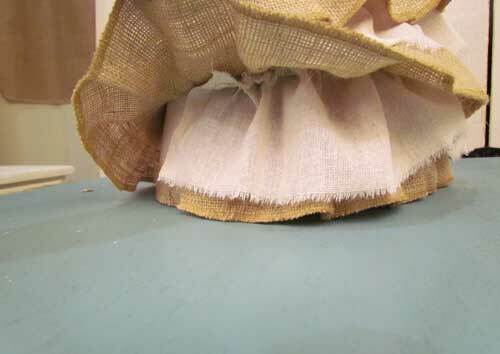 Glue a small piece of the 2″ ruffled burlap all around the top to finish it off and to hide the top of the cone from sight. Now for the star topper. 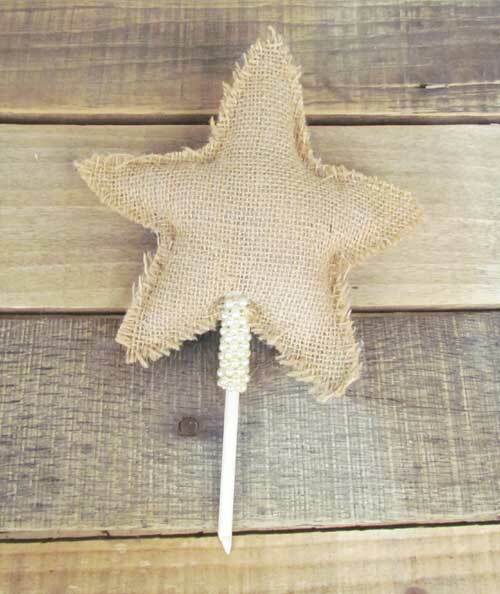 Clip a small hole in the bottom of the star ornament and insert the dowel rod. Push it fairly far up so that it will keep the star secure and upright. Secure with glue. Wrap the plastic pearl beads around the base of the dowel rod. 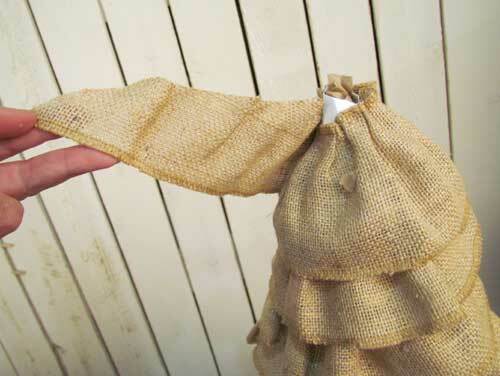 You could also use jute for this if you wish instead of beads. After all glue has set, insert the bottom of the dowel rod into the top of the tree. If you don’t feel it hitting some of the paper stuffing, then stuff a little more into the cone from the top. Small pieces work best. Use a generous amount of glue to glue the dowel rod into the cone. Like a LOT of glue. It’s going to have to fill up any airspace left around the papers to hold the star securely. Now this step is not always necessary. But if you find that the top of your tree is kind of messy looking where the star goes into the tree, you can glue some coiled up jute into place around the stem of the star to hide any messiness. I made several trees this weekend and some needed this little extra cosmetic and some didn’t. There you have it! 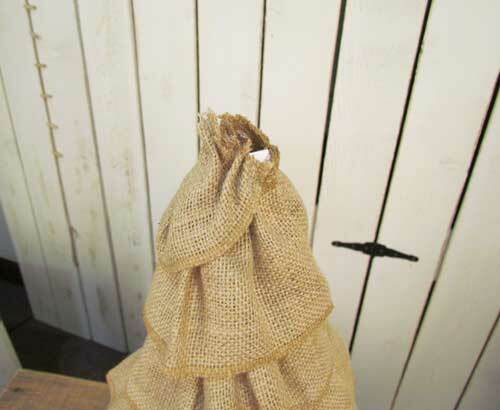 A great easy way to make a holiday burlap tree with lots of “wow” factor. Of course, this design can be developed in so many different directions. 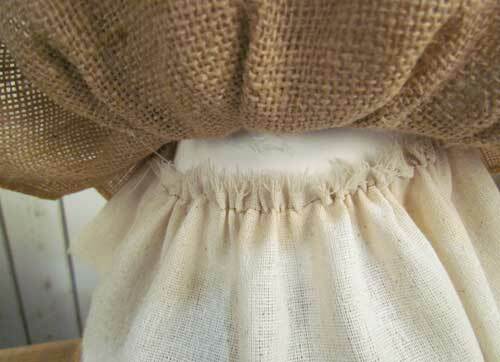 One of my favorites is to leave out the white fabric and just make the burlap rows closer together. 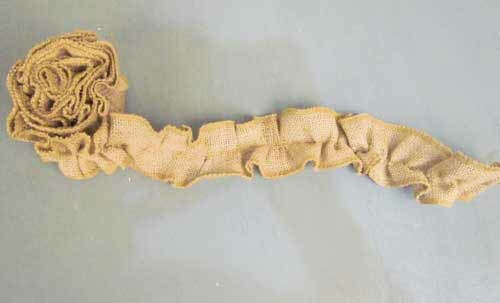 If you do that you’ll need twice as much of the 4″ ruffle and you’ll want to space the rows about 2″ apart. 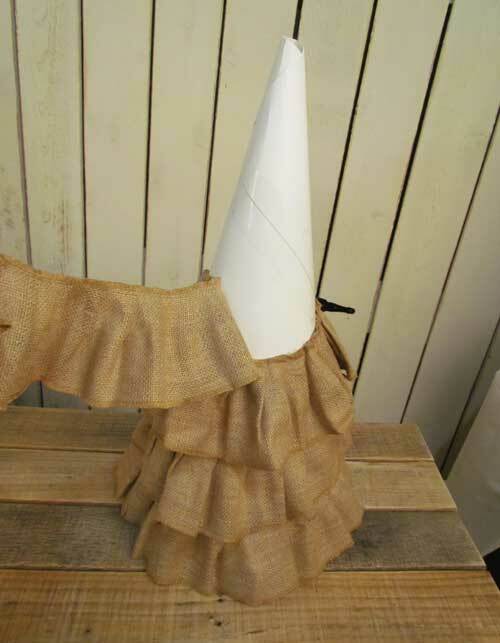 Another great version is to cover your cone with burlap first and then glue the 2″ ruffle around in a spiral pattern with about 1″ between the rows. Both of these alternative designs are included in the picture below. Are you inspired to give this a try? Will you make one just like one of these or will you put your own special touch to it and make something uniquely yours? We’d love to see pictures of what you make!